Being “In The Zone” – Blessing Or Reflection? Well, a couple of weeks ago, I was randomly looking at music videos on Youtube when I stumbled across the Youtube channel of a guy called Eric Calderone, who is probably one of the best guitarists that I’ve ever heard. Seriously, he can turn almost any song in any genre into an absolutely amazing piece of heavy metal music. Even though his videos just show him playing the guitar, they are also somehow amazingly fun to watch too. At first, I thought that this was because some part of my subconscious mind saw these videos as a chance to vicariously live out my old teenage fantasy of becoming a guitarist in a metal band (I learnt how to play a few powerchords and a few parts of various songs, but that was about it). It took me a couple of seconds to realise that the real reason why Eric Calderone’s videos are so fun to watch is because he’s grinning with elation in almost all of them. If you want an example of what creativity should look like and what it should feel like, then check out his videos. Anyway, watching these videos made me think about creativity in general and about what most writers and artists refer to as a “creative flow”, “being on fire” or “being in the zone”. If you want to be a bit more esoteric and new-agey then it can also be called “being in the vortex” too. Whatever you want to call it, there’s a certain feeling which comes with the best kind of creativity. There’s a certain feeling that comes with being inspired and creating something amazing. There’s a certain feeling which comes with immersing yourself in whatever you are creating. If you’ve ever experienced it, then you probably know what I’m talking about here. But, I’ve written about all of this before, so I won’t go into too much detail about it again. However, there was one other thing which I realised when I watched the videos of Eric Calderone playing the guitar – he knew how cool his music sounded. Honestly, you can’t play guitar with an expression like that if you don’t know that you’re playing something amazing. Anyway, this made me think about “being in the zone” in a slightly different way to how many people think about it. Maybe “being in the zone” isn’t just a lucky accident? 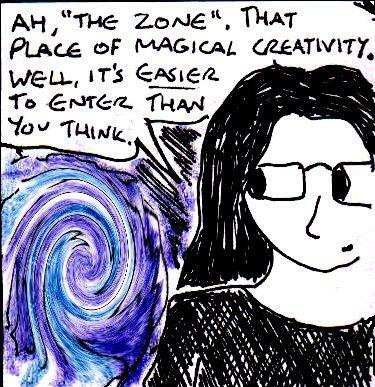 Maybe “being in the zone” isn’t just some strange and mysterious blessing which is occasionally bestowed upon artists, writers, musicians etc… seemingly at random ? Maybe “being in the zone” is a sign that you’re producing something amazing? If you think of “being in the zone” as a reflection of the quality of what you are creating rather than some kind of mysterious blessing or piece of good luck, then it makes a lot more sense. Many of the best stories, songs and works of art are honest. They’re a reflection of the imagination, personality, soul and/or emotions of the person who created them. And, when you’re creating something which honestly reflects what you feel is amazing and/or something which reflects some part of yourself honestly, then it is going to feel amazing. After all, not only are you creating it, you’re also the first person to see, read or hear it too. In other words – you are also part of the audience too. If you think about “being in the zone” in this way, then you’re probably going to find yourself in that magical “zone” a lot more often than if you just see it as a rare and lucky blessing. This entry was posted in Art, Writing and tagged creative flow, creativity, in the zone, inspiration.